Comments: Fragments of feathery abramovite crystals (RRUFF ID R070037), co-type sample.. Location: Kudriavy, Iturup Island, Russia. Scale: See Image. Location: Namibian dessert, more or less due West of Uis, Namibia. Scale: 8.5 x 2.5 x 2 cm. Location: Ojuela mine, Mapimi, Durango, Mexico. Scale: 5 x 5 cm. Comments: Black, rounded balls of cryptomelane and purple, transparent adamite. Location: Ojuela mine, Mapimi, Druango, Mexico. Scale: Not Given. Comments: Sprays of adamsite-(Y) crystals on matrix. Location: Mt. St. Hilaire, Quebec, Canada. Scale: 1.5 cm. 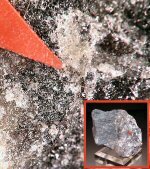 Comments: Fully-terminated, prismatic crystal of aegirine. Location: Khibiny Massif, Kola Peninsula, Russia. Scale: Crystal size 2.8 cm.